The 2nd generation Drobo storage system with FireWire 800 is really slow (real world tests were around 28 MB/sec), and the RAID system is completely proprietary. It’s not recommended as a primary storage system for data that you care about. If you have a need to store lots of data on a single huge volume and you can afford to loose the data it might be an okay solution. – Really easy to use. Great for people that know nothing about computers. – Can store a large amount of data on a single volume. Good storage for all the TV shows you download. – The RAID system is completely proprietary. If the unit crashes you have few options for getting your data back. – The 2nd gen FireWire 800 unit is really slow compared to most any other FireWire 800 enclosure. The bottleneck appears to be in the processor/hardware inside the Drobo. – Bad place to store your only copy of your photos that you really care about. 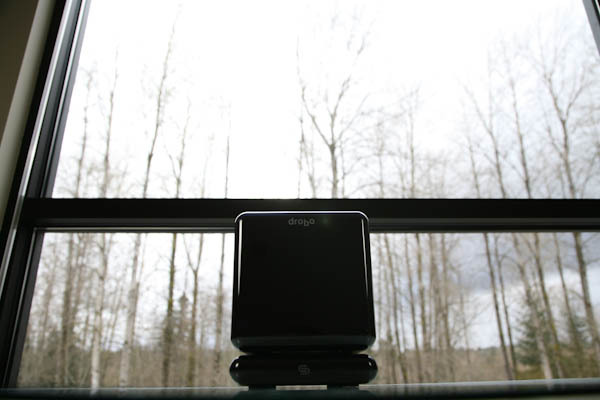 I’ve had a pair of Drobo 2nd generation storage systems in the JonoTech lab for a couple weeks. I’ve been testing them out with various drive configurations. I’ve had them connected to both a Mac Mini and a Mac Pro Nehalem. 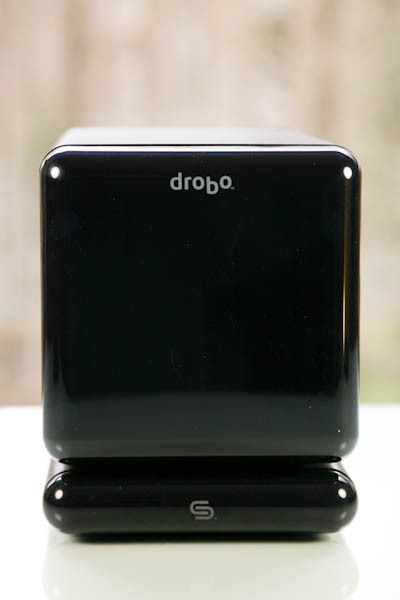 I’ve been curious about the Drobo for quite a while. They seem like a really neat storage system. 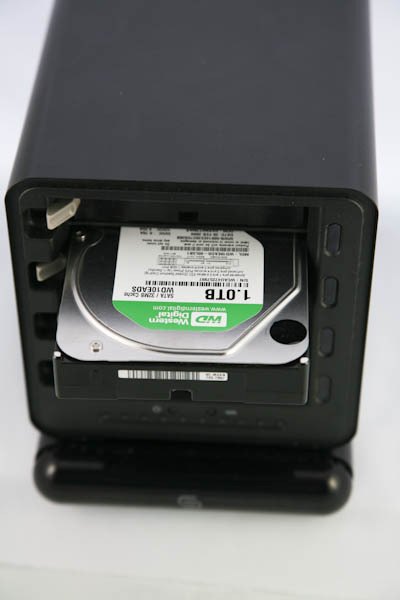 The 1st generation Drobo was plagued with problems. There are all sorts of horror stories of people loosing their data. The 2nd generation units have had a better reputation. Many users have had them up and running for a year or two without any problems. Still you always have to ask yourself, if the Drobo died and I couldn’t get the data back, what would I do? If you didn’t have the data backed up somewhere else, you might end up sending the unit back to Data Robotics Inc, and they might be able to get your data back. There are many positive customer service reports on the internet, so this is definitely an option. But if you did use this as your primary data store, and it took Data Robotics a week or two to return the unit would that be okay with you? If you’re a professional photographer not having your images for a couple weeks could be a serious problem. Of course professionals always have an offsite backup of their data (right? ), so this situation would never occur in real life. For the performance tests I used 4x WD Caviar Green 1 TB SATA (WD10EADS) with the 32MB buffer. If I put these drives directly in my Mac Pro I can get about 70MB/sec transfer out of a single drive. In other RAID configurations I can get even higher. But for all practical purposes lets say a single WD10EADS is capable of running about 70MB/sec. When you put 4X 1TB in the Drobo you’re getting 28 MB/sec. The Drobo’s firmware/hardware is clearly the bottleneck because the drives are capable of much higher transfer rates. On a gigabit network I’m averaging about 13 MB/sec transfer with the DroboShare. This is completely insulting. Overall the Drobo is an okay solution for people that have big storage needs, but know nothing about computers. Granted this is kind of the user group the Drobo was designed for.